Americans Little Caesar were one of those late-eighties/early nineties bands that, solid though they definitely were, just couldn’t withstand the grunge tide that inundated the music industry of the time. Effectively left high and dry by a record company that simply wasn’t interested in hard rock anymore, the band’s career withered on the vine. That they return in 2017 with a new label and a new album is as much a testament to the general public’s voracious thirst for nostalgia as much as anything else, but, if a band ever deserved another shot at whatever constitutes the big time these days, it’s Little Caesar, who simply are too good to be allowed to die. There are some spine-chillingly good songs on Eight, the band pooling their combined talents to back the superb vocals of Ron Young to maximum effect. First single Time Enough For That is, quite simply, one of the best songs I’ve heard in years in it’s field. A lazy, soulful ballad that builds and builds like all the best eighties radio staples, it’s a goosebump-inducing exercise in excellence. Similarly the fast-paced country shuffle of Mama Tried is out of this world too, a playful combination of Johnny Cash and The Georgia Satellites that’s sure to get the toes tapping when you’ve had a couple of wets and the mood is right… And talking of wets, Another Fine Mess is as good a bit of barroom boogie as you’ll year this year too. Morning is another shot of sheer class, mixing a great chorus with some superb guitar playing from Mark Tremalgia and Loren Molinare. In an album full of great performances, Young saves his best for this track. Final track That’s Alright sounds like Sammy Hagar getting it on with Status Quo, but don’t let that put you off – this is a truly special album, even if you don’t remember the band from their first trip around the sun. Highly recommended! Eight will be released by Golden Robot Records on March 16th. 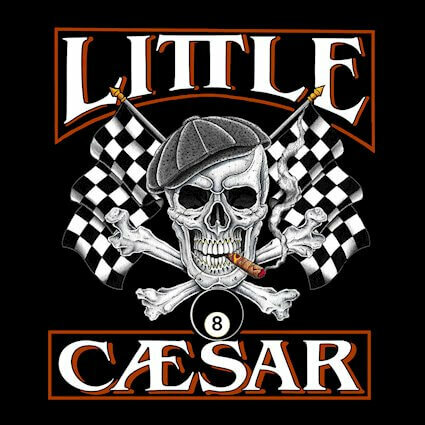 I’m the Lead Singer in Little Caesar. Though Alex Kane is a great and valued former family member, Mark Tremalgia played guitar and co wrote the songs on this album. Thanks for the coverage and kind words though!! thanks for pointing that out – Gavin has been duly reprimanded and given a Chinese burn. Thanks for the great album! – Scott Adams, editor, Sentinel Daily.